At Dream Kitchens & Baths our selection of cabinetry covers all of the construction options in the market. Our “entry level to mid priced” cabinet are from Marsh Furniture Company. Marsh’s Semi custom approach allows them to deliver built to order cabinetry in less time than most. Marsh Furniture Company comes from High Point, North Carolina, which is widely known for being the furniture capital of the world. Since 1906 Marsh has built a reputation providing value priced products balanced with the “furniture finish” that customers have grown to expect. It is this balance that really gives them an advantage at this price point. Marsh Furniture offers numerous finish, paints and glazing options on Birch, Oak, Maple, and Cherry. Marsh Furniture is also one of the few cabinet companies in the market that makes their own doors. 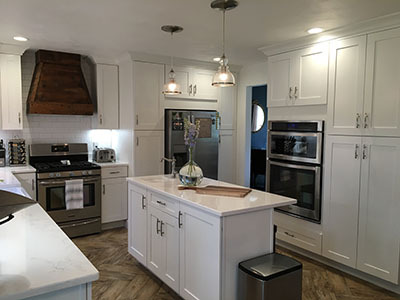 The newest addition for us is Wolf Transition Cabinetry. Wolf Transition is Full Access (Frameless) which gives the client more interior space than a typical Framed cabinet. This means more storage in your cabinets. They have a lot of options for styles and finishes on different wood species. Mouser cabinets cover our Semi-Custom to Custom demands. Their options are unlimited and their construction is second to none. They offer different finishes on Oak, Maple, Alder, Cherry, Pine, Hickory, Bamboo, Wenge, Zebrawood, and numerous Foils. Mouser also gives the consumer the option on “Full Access” (Frameless) with their Prizma line. Our kitchen countertop selections include laminate, solid surface, quartz and natural granite. The laminate offerings include Formica, Wilson-Art, and Pionite including the new “High Definitions” with numerous edge options. Solid Surface includes Corian, Wilson-Art, and Hi Macs. Quartz options are Cambria, Silestone, Hanstone, & Others. Natural granite is natural and the selections are limitless. We also have access to more rare options like glass, recycled glass and concrete. We also cover the plumbing options with our brand selections. We are dealers of Kohler, Delta, Moen, Elkay, Brizo, Grohe, Toto, American Standard, etc. Flooring options are endless in our showroom. We carry all Best Tile and Larry Lint tile, ceramic and porcelain. We have added Karndean which is a high performance vinyl that comes in wood and tile looks. 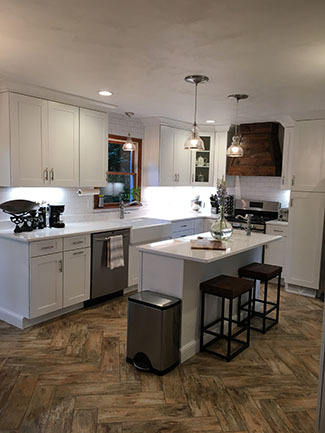 Our newest addition is Somerset Hardwood Flooring which has a wide variety of solid wood options as well as engineered wood options in many wood species and finishes.